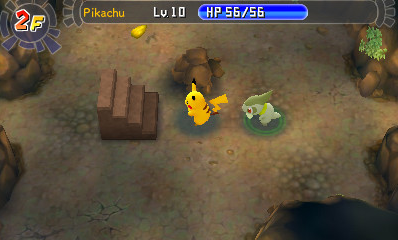 Pokémon Mystery Dungeon: Gates to Infinity is a dungeon-crawler and role-playing game developed by Chunsoft for Nintendo. In it you take a control of between 1 – 4 Pokémon and go forth to explore dungeons, battle enemy wild Pokémon and find items so that you may complete requests or simply reach the end of the dungeon. 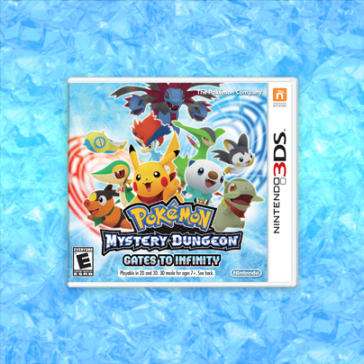 Like the previous Mystery Dungeon games, Gates to Infinity puts the player in the role of a human who has been mysteriously transformed into a Pokémon and summoned to the Pokémon world in order to save it from destruction. Whereas previous games asked you a set of questions in order to determine what Pokémon you will be playing as, Gates to Infinity allows you to choose your player Pokémon from a choice of ; Pikachu, Axew, Tepig, Snivy and Oshawott. When compared to the likes of Explorers of Sky there is a noticeable lack of Pokémon choices, which leads me to one of my main complaints for the game; lack of content. There are two main things you do in Gates to Infinity: Building/improving Paradise (a large area where your partner has decided to build a paradise for Pokémon), and exploring Mystery Dungeons, which are randomly-generated dungeons with a set amount of floors. While you explore dungeons, you must battle enemy wild Pokémon in order to gain EXP, level up and learn new moves (very much like the regular Pokémon games). Combat is turn-based and movement takes place on a grid-based system ; whenever you take an action (be it simply moving, attacking or using an item) every other Pokémon will take an action too, with this system, you have all the time in the world to plan your next move. To some degree it also affords you the ability to strategically position your Pokémon to keep them out of danger and make the most of their abilities. While in combat you only control the lead Pokémon, but through the use of the Tactics option, you can order your allies to follow a certain instruction such as follow the leader at all times, go after the enemy, retreat from battle, etc. 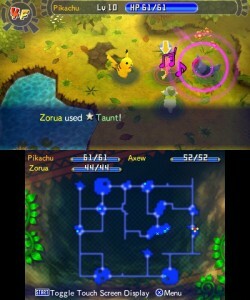 Fans of the original games and the previous Mystery Dungeon games will immediately recognize that each Pokémon can have up to four moves learned and can use them at any time during combat. Each and every move has their own type, attack power, PP and accuracy ; if a move runs out of PP, then that move can no longer be used until you use an item to restore it or exit the dungeon. 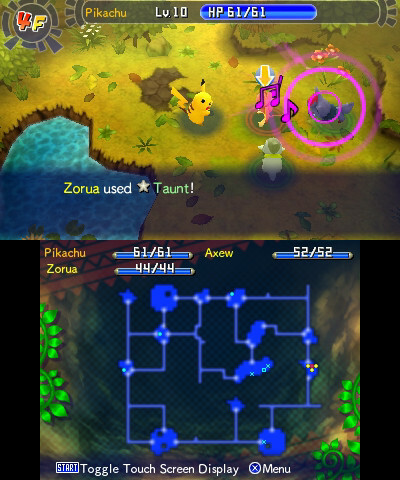 Not too far into the game, you will eventually be able to level up your moves, this is a feature that is new to the Mystery Dungeon games, the more you use a move, the more powerful it gets. You will notice your moves will increase in Power, PP AND accuracy. Move levels are shared between Pokémon and will be retained even if you decide to forget a move in order to learn a new one (moves can be retaught back at town). This is a great idea as it allows weaker moves to become more powerful even in later sections of the game, as well as make the game feel more like an RPG, and should keep completionist players both busy and satisfied. There is a large variety of items you can either buy from shops or find in dungeons that will help you in battle. While most items aren’t really necessary during normal battles, you will most likely find yourself using the same buff and healing items during the boss fights, making them absolutely vital. However, part of this leads to my second complaint of the game; the game is rather luck-based (not that you expect anything otherwise from an RPG with randomly-generated dungeons). What I mean is ; depending on what enemy Pokémon you run into, depending on what moves they happen to use, and depending on whether that moves hit you can make the difference between victory and defeat. Sometimes an enemy Pokémon will put the player to sleep or paralyze them and then proceed to land a few lucky hits, resulting in you being KO’d. Should the Player Pokémon or Partner Pokémon be KO’d you will be transported to your last checkpoint and lose a few items, and when this happens several times in a row, it can definitely become frustrating… Add to that fact that each floor of a dungeon is randomly generated, sometimes, you will spawn right next to the stairs that leads to the next floor, sometimes, you will search and search until eventually, the stairs will be in the very last room you search. Thankfully, it is impossible to get stuck in dungeons whether it’s because the enemies are too difficult or whether you didn’t grind enough, with the help of “Companion Mode”. This tool allows you to switch to other Pokémon in your team who are back in town in order to complete requests and receive more items that will automatically be put in the deposit box which the player can access from within the dungeon to help them on their way. Receiving outside help is a welcome addition as the story sections of Gates to Infinity can take a long time to complete. Story sections usually involves exploring up to four or five dungeons in a row without being able to return to town for supplies, and this is specifically what Companion Mode was designed to assist with. 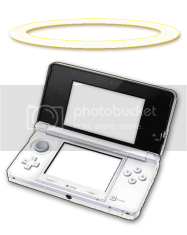 Speaking of outside help ; should you fall in a dungeon you will be asked whether or not you wish to activate SpotPass in order to get help from other players who happen to be playing the game nearby. If they choose to help you and successfully rescue you, you can simply hit the “Revive” option and continue exploration from where you have fallen. You get to build your own Pokémon Paradise! 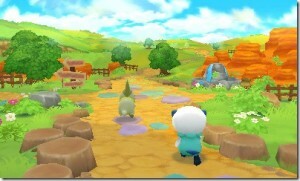 The main gimmick of Gates to Infinity is that you’re building your own Paradise for Pokémon. You can use materials to build all manner of different facilities, such as farms for growing your own berries and seeds, shops that sell useful and random items, mini games with prizes, and even dojos to train moves of certain types. Materials are rewarded through completing requests and the game has made it very easy to let you know which materials are required for preparing land as well as building and upgrading facilities. There is “View Materials” option in the menu letting you know what is required for each task and how many units of each material you have on your person. As you prepare more land, more Pokémon can join your team, and as you build more facilities you have more options with what to do with your facilities. That said, everything you do with Paradise is completely optional. It takes time to get everything up and going, but once you do, the rewards you get from it really help you out when exploring dungeons (especially the more difficult dungeons you unlock post-game). As with the previous Mystery Dungeon games, you progress through time as you complete requests on the bulletin board. There isn’t a whole lot of quest variety though, the main ones seem to be to either rescue a Pokémon from a certain floor of a certain dungeon, find an item from a certain floor of a certain dungeon, or defeat a Pokémon from a certain floor of a certain dungeon… As you complete requests, however, you recieve points, and once you accumulate enough points, your team will rank up, giving you more inventory space as well as some neat rewards. Overall, Gates to Infinity is a decent Mystery Dungeon game, but when compared to Explorers of Darkness/Time/Sky, it is definitely a noticeable step-down. However it is still be an enjoyable experience. For £40, I can only recommend this to die-hard Mystery Dungeon fans who know what they’re in for, for everyone else, even if you’re interested in the game, I say wait for a price drop to £30 or even £25 before picking this up.